Happy Monday! It's hard to believe that Thanksgiving 2012 has came and went. It's time to divert my attention from food to manis! Today I'm showing you something different. I must be the last person on the planet to try real, no kidding, nail polish strips. I bought two packs of Sally Hansen Salon Effects Nail Polish Strips on clearance at Target. They were intended for my daughter's Christmas Stocking...but she found them! 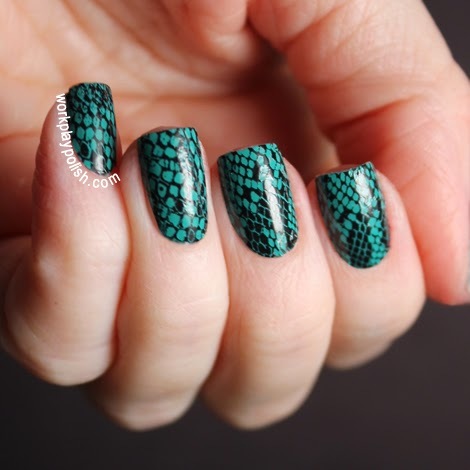 The pattern I'm sporting is 004 Hisss-terical, a green/black snakeskin print. It took me a nail or two to get the hang of it. I have narrow, curved (from side-to-side) nail beds. So a strip narrow enough to fit my cuticle line didn't cover my entire nail up at the tip. What I didn't realize was how much the strips stretch. I was able to position the strip along one side of my nail and then gently stretch it to reach the other side. 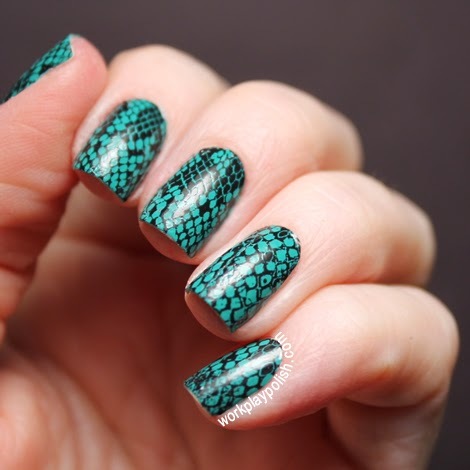 With a snakeskin pattern, you can get away with a lot of stretching...but I imagine most patterns aren't that forgiving. You can see on the tip of my pinky how too much stretching can make things look a little mangled. I really like it. The color and pattern are cool and it really doesn't look any different from a regular mani with a stamp. Plus...no dry time. My only gripe was taking them off. I used pure acetone. It was a hot mess...smearing, globs, pieces stuck in the cuticle. Next time I'll be a little more strategic with the removal. Have you guys ever tried them? What did you think?